The Rising Phoenix: Meet Note! Since we’re in Thailand, I’m trying to interview some Thai participants at the conference. 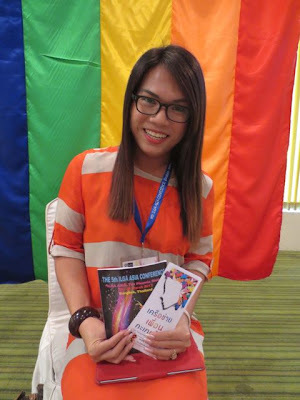 Jetsada Taesombat, aka Note, is a coordinator of the Thai Transgender Alliance in Bangkok. YS: What do you do in your organisation? Note: The first point that we want [is] to build knowledge for transgender issues, because in Thai society we lack the knowledge about transgenders. The knowledge we have is about medical issues - it is not friendly to us, it is biased. Because the doctor says we are mentally ill, like the sexual deviants. But we try to reconstruct, based on the right to self-determination. The second is policy advocacy, because the Thai people have specific needs, like the Gender Identity Law and Civil Union Act, and [issues about] the military recruitment. When transgenders are 21, they have to go for military recruitment, and we have to make sure we do not get sexual harassment. We work as partners with the Thai government. We work with many networks and organisations – the Human Rights Commission also, we work for six years. And the last part is capacity building, skill building, for transgender activists. Because now, in Thailand, English is not our mother tongue. As you see, if we can speak English we can communicate with all people about the world. That is important. YS: How do you find the conference? Note: The conference is good. 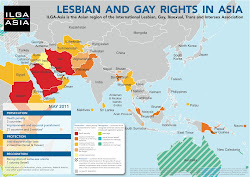 I think I get many information about the situation in human rights in Asia. I meet some friends – I know transgender friends also; [we will] keep connections and be working together in the future. I’m really interested, because many conferences will focus only on HIV/AIDS, but in this one we focus on human rights. It’s very important for us, especially for transpeople. YS: Is the translation okay? Note: Yes, the translation is okay. I think they prepared for the interpreter. But I have to practice more English also for the international conference. Sometimes it is quite hard because some participants speak very quickly. YS: Is there anything else you want to say? Note: I think this conference should give more opportunity for transgender people. If we saw the numbers of the participants, most are gays and lesbians and a few are transgender people. In the future, I hope they will grant scholarships for transgenders also, equally.